If your small business is shopping for a new phone system this year, there’s a good chance you’ve heard the term “hosted phone system” thrown around. While “hosted” might seem like a buzzword, these systems are not just here to stay, but are affordable alternatives to traditional telecommunications. The terms “hosted” and “VoIP” might be used interchangeably, but there are distinct differences between the two. Just like all squares are rectangles but all rectangles aren’t squares, all hosted systems are Voice over Internet Protocol (VoIP) systems, but not all VoIP systems are hosted. Hosted phone systems use the internet to transmit data, however, the heart of the system (servers, applications, etc.) is located at a secure data center, not at your business. How Does a Hosted System Work? In modern hosted systems, like those set up by McEnroe Voice & Data, your phone system will have servers and switches held in a data center, and you pay a fee to connect to your phone system. 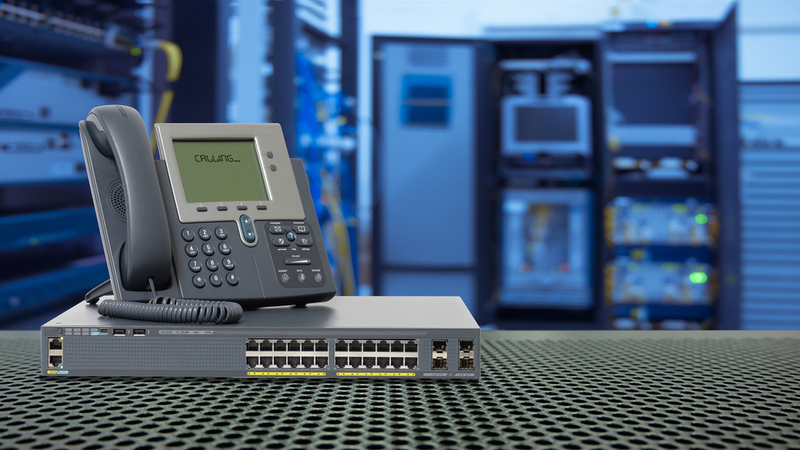 You will have IP-based phones on your desks that will automatically connect back to the off-site system. At the data center, we will take care of completing updates and upkeep as needed, so that you don’t have to worry about installing upgrades, completing repairs and the stress of managing a phone system. You will also enjoy monitoring and support around the clock. No Server Onsite: With a hosted solution, your phone system resides in the cloud, in a controlled environment. Power outages, user error, and irregular temperatures in your IT room are something you won’t have to worry about. Effortless Upgrades: Are you worried about upgrading your whole system just for it to be outdated in a year or two? A hosted phone system is constantly being upgraded and monitored at a remote location, so you never even need to think about it, your system will always be up-to-date. Line Sharing: McEnroe’s unique hosted phone solution allows sharing lines at multiple locations. If you have a business with two or three locations, you don’t need to have strict dedicated lines at each one, rather, you can have 20 lines total and share them between all your locations. Moreover, if all your lines are in use, our hosted phone system will allow you to “burst” and use another line from the cloud, so no more missed calls! Posted in Business phone system, Hosted Phone Systems, Hosted Solution | Comments Off on Should I Get A Hosted Phone System for My Business? How Can Call Center Software Increase My Business Revenue? Call center software makes workflow more efficient and improves the customer service experience. Posted in Hosted Solution | Comments Off on How Can Call Center Software Increase My Business Revenue?